Tiara Crown from Montana Silversmiths. Click image to enlarge. Perfect for any Queen, this Tiara Crown is customizable and made to order with your engraving. Engraving must be ordered at the time of original order; it cannot be added after the crown has been produced. Hat Tiara accommodates 2 lines of engraving and Date or Small Figure. Stones included in the price. 3" height. Bright, sparkly and gorgeous, the Tiara Crown is made for generations with the legendary MONTANA ARMOR finish. 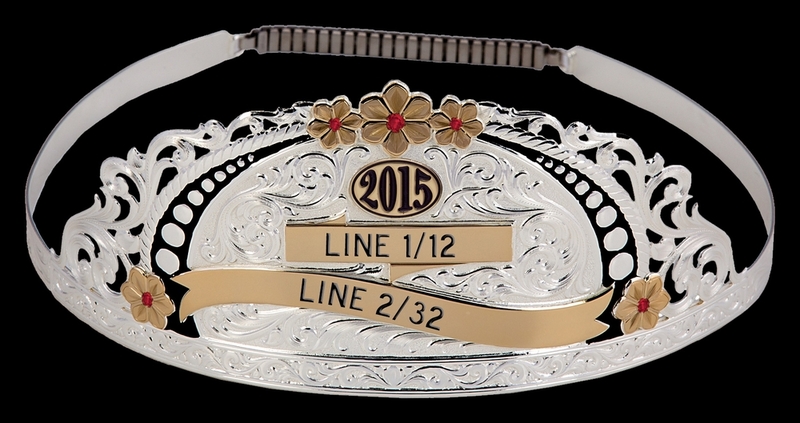 This latest iteration of Montana Silversmiths classic award crown is larger than the original and offers a truly unique award piece! Place your order now. As in all custom products, requires 4-6 weeks to ship.